New Year Resolutions are so much fun to break! I was doing reasonably well on the “no more cookbooks” scenario, but then I read a post on Taste Food that changed all that. Lynda announced that her recipes would be featured in a soon-to-be-released cookbook, a collaborative effort with Barbara Bryant & Betsy Fentress. I did not even blink: pre-ordered it right away at amazon.com. A full cookbook devoted to almonds, with recipes from one of my favorite food bloggers! That should not (and will not) count as breaking a decision. I had no choice. It was meant to be. 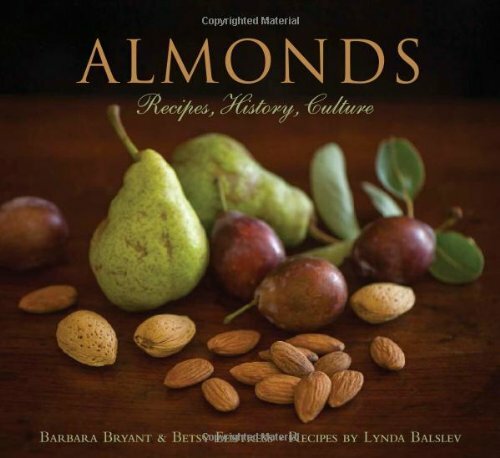 The book is called “Almonds: Recipes, History, Culture“, and you can get it with a simple click here. Disclaimer: I am not affiliated with amazon.com, will receive no compensation whatsoever if you get the book. I just happen to think it is a wonderful publication that my readers will certainly enjoy as much as I did. Almonds are a favorite ingredient of mine. Interestingly enough, Lynda opened my horizons to almond butter a year or so ago, when she published a post on cookies using it. I made those cookies, and have been a huge fond of almond butter ever since. Clearly, you will all agree that her cookbook had to be in my kitchen. It was meant to be. Have I said that already? Hummmm….. 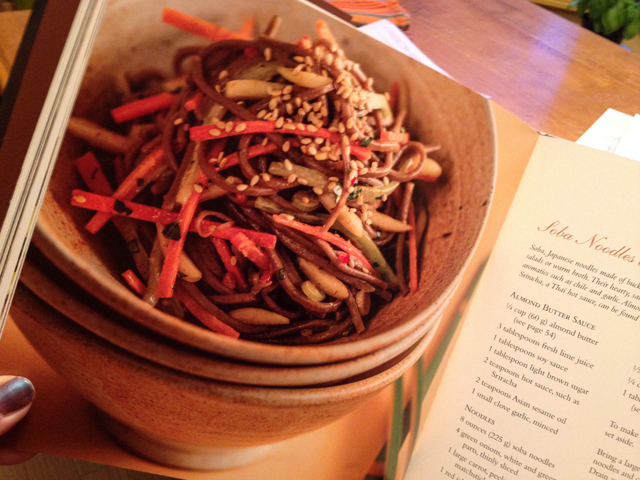 Without further delay, I share with you the first recipe I made from Lynda’s book. Heat 1 tablespoon of the oil in a large saucepan over medium heat Add the shallot and cook until softened, about 2 minutes. Add the mushrooms and 1/2 teaspoon of the salt. Saute until the mushrooms begin to soften, about 2 minutes. Add the garlic and thyme. Continue to cook, stirring, until the mushrooms begin to release their juices, about 2 minutes more. Add the farro and stir to coat. Add the wine and cook until the liquid is nearly evaporated. Add the stock. Bring to a boil, then reduce heat to low. Cover and simmer until the farro is tender and the liquid is absorbed, about 30 minutes. While the farro is cooking, heat the remaining 1 tablespoon of olive oil in a large skillet. 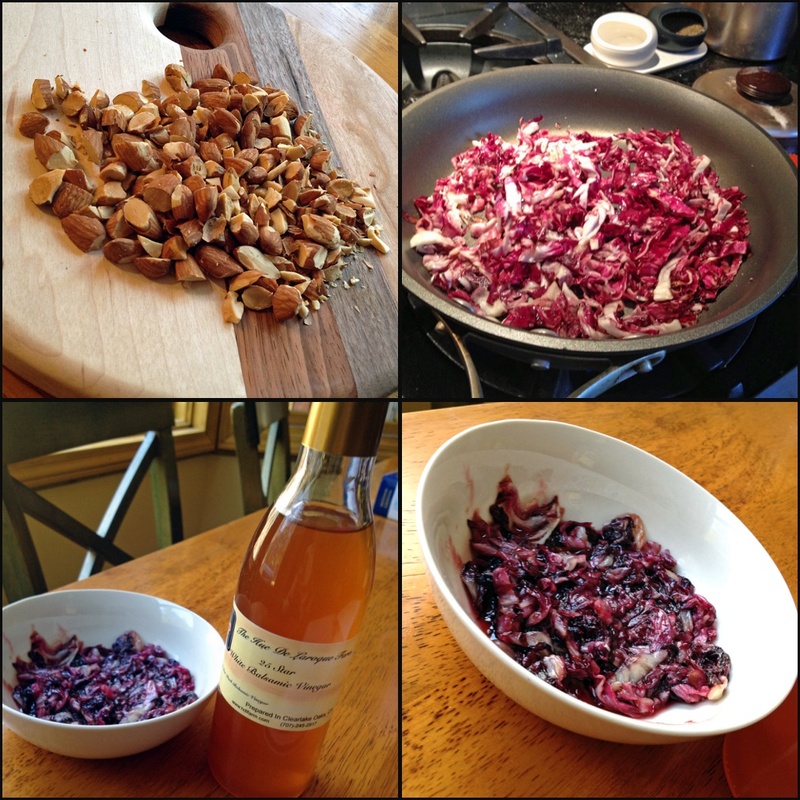 Add the radicchio and saute for 1 minute. Add the balsamic vinegar and cook, stirring, until vinegar has thickened and coats the radicchio, about 1 minute. Remove from the heat and season with the remaining 1/2 teaspoon salt. When the farro is tender, stir in the radicchio, half of the almonds, half of the cheese, and season with freshly ground pepper. Taste and adjust the seasoning. 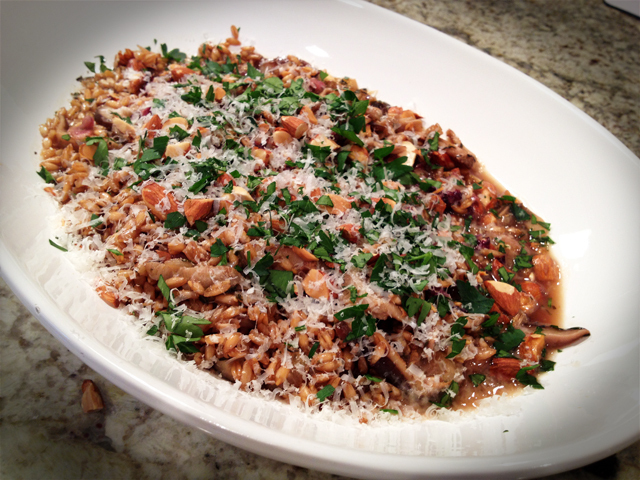 Place the farro in a serving bowl, sprinkle with the remaining almonds and the remaining cheese. Garnish with parsley, and serve immediately. Let’s take a virtual tour of this beautiful cookbook, shall we? The book opens up with an introduction about almonds, in which you will learn a lot about this exotic, versatile fruit, which is in fact not a true fruit, but a drupe. From its origins in the Middle East, to the way it is farmed today, and its absolute requirement of bees for pollination. Did you know that to make sure the almond trees will bear fruit, farmers in California often have to order special shipments of bees, that travel by trucks sometimes all the way from Texas? I had no idea. I often skip introductory chapters in cookbooks because I find them for the most part quite boring. For instance, cookbooks that start with “equipment needed”, “ingredients”, or “useful gadgets” just make me roll my eyes to the ceiling and skip those pages without feeling guilty. Not the case in this book. I savored each paragraph and could not put the book down. The photos in the introduction are spectacular, and that quality is maintained throughout the whole book, almost every single recipe has a photo that goes along with it. Very few exceptions. And now, onto the recipes. The book is divided in courses, and I will list the recipes that tempted me the most in which chapter. Salads & Vegetables : I wanted to make every single recipe of this chapter, but just to list a few, here we go: Asian Citrus and Almond Slaw… Provencal Tuna Salad with Almonds, Olives and Capers in Lettuce Cups… Winter Kale and Quinoa Salad with Carrots and Raisins (amazing colors! )… Zucchini Carpaccio with Toasted Almonds. If you are a regular visitor of Lynda’s blog, Taste Food, you’ll know what to expect from this cookbook. If you are not, I hope you add her blog to your list of tasty places to visit in the blogosphere. I’ve made several recipes (and blogged on a few) from her site, and have many on my list to prepare at some point in the future. Her site is elegant, straightforward, a real pleasure to visit. Lynda, thank you for giving me permission to publish this delicious farro recipe, I wish you, Barbara and Betsy a ton of success with this cookbook! wow, “Almond-Crusted Pork Chops with Sweet-and Sour Apricot Glaze” you could stop right there. Just thinking about it makes me want to walk to wherever I can get this book! Isn’t that amazing? so many recipes I want to cook from her book! What an exciting recipe, Sally! I love risottos…It is great to see it made from something else rather than rice. I would love to take a look at that cookbook as well. By the way, great review! You rocked on this and the My Rio de Janeiro one as well. 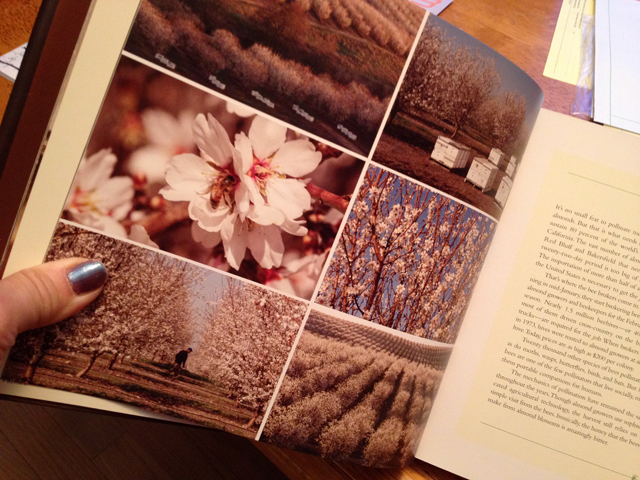 I thought you would love that book from Leticia… but this one is wonderful too, I love, love, love almonds! Just made a huge batch of homemade marzipan… Almonds are so very great! Glad to hear about this book. Wonderful recipe! Homemade marzipan! WOW! Color me totally impressed! It requires some work, but it’s worth it. How cool! I know your Mom will love this book, it is super special! I too own a copy of this beautiful book and can’t wait to cook from it. 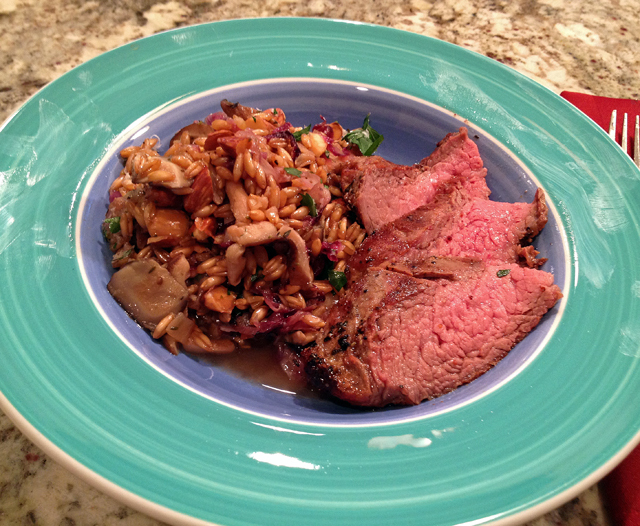 Love this farro dish, I’ll be sure to cook something else so as to share a different critique. Looks lovely! Luckily I’m not in the market for any new cookbooks cause several of those recipes sound very tasty. I was hoping you would notice your board! 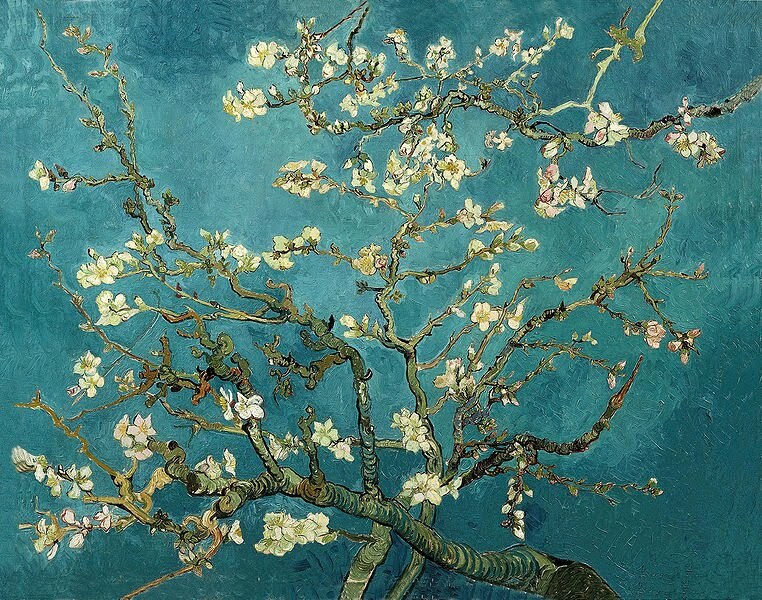 As I mentioned to you by email, we are both quite protective of it… and no, I didn’t cut the almonds on it, I used a “lesser board” and transferred them to your masterpiece just for the photo… see? That’s how much I love your cutting boards! Wow, a whole book about my favorite nut! Your risotto looks amazing. Nice to see you here, Becky! I am not sure which nut would be my favorite, I think I would place three in very close proximity for the first spot: almonds, cashews and macadamias…. cannot quite decide. But almonds are so versatile! This cookbook sounds amazing, love this salad. It’s a great cookbook, I am glad I did not try to resist its charm! I think your course of action was totally necessary! And really, you were just doing your duty by a fellow blogger. 🙂 This cookbook sounds amazing! I adore almonds and try to eat them whenever and wherever I can. Plus that farro risotto is totally my kind of meal! I am glad you understand me so well…. Action totally necessary defines it. Makes me happy. Sally, thank you so much for the lovely review. This is one of my favorite recipes from the book. Happy cooking! My pleasure! Loved to share my views of the book here, and wish you tremendous success with it! What a great cookbook! Your risotto looks wonderful. What a lovely post! The farro looks absolutely divine – great flavors. Love your fingernail polish!! !